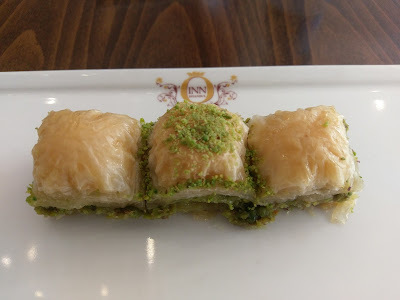 The food I've eaten so far has been mostly lentil soup, hummus, amazing fresh fruits, and this glorious baklava. 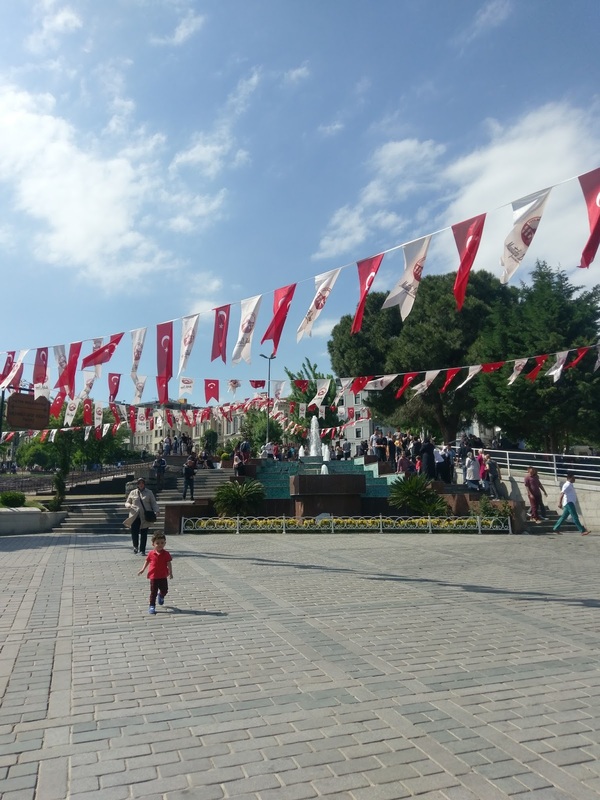 These flags reminded me of Piccadilly Circus in London. I loved how so many people were out enjoying the beautiful weather, sitting in the parks, having picnics and walking around. 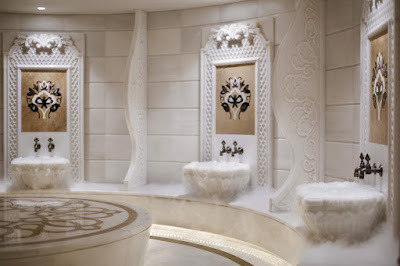 After the initial confusion of not knowing how to fashion a dress out of a tiny scarf, and a co-ed sauna/steam room situation, I was put on a warmed marble slab, scrubbed within an inch of my life (although it felt nice), encased in three feet of bubble suds (literally), and rinsed down with silver bowls of hot water. Afterwards, I had a blissful massage, which I fell asleep during but still enjoyed. In all it was a great way to end my first full day in Istanbul. 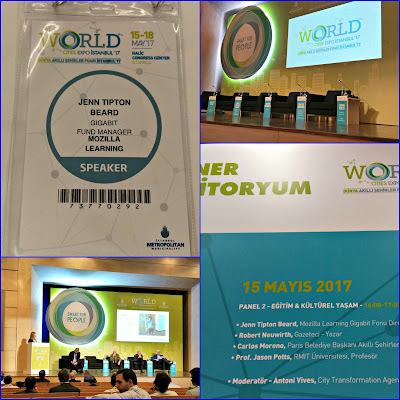 Monday was the start of the three-day World Cities Expo. I was on a panel about the intersection of culture and technology, which I found out about as the panel started (I had been told it was about education, so I vamped a bit). The three other panelists were very interesting and accomplished so we had a nice conversation after our individual presentations. The presentations were in English and the questions were in Turkish, so we switched between wearing headsets with an interpreter doing live translation. 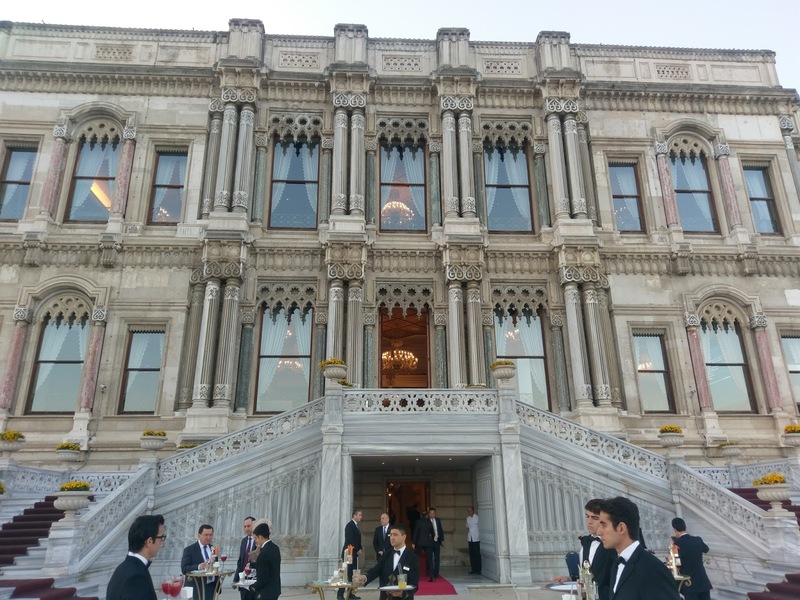 After the day of presentations and speakers, we headed to the Ciragan Palace for a gala. This former Ottoman palace is now a five-star hotel and is the only hotel in Istanbul accessible by boat. 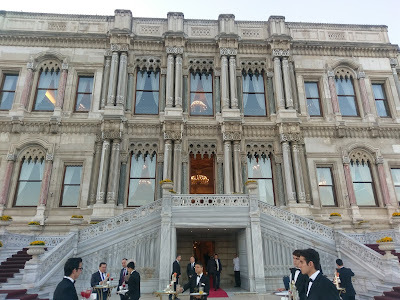 We had juice on the terrace before going inside to the ballroom for a five-course meal and live traditional music. We then headed back to the hotel afterwards to rest up for another day. Thanks for stopping by the blog!